Solandra is an idyllic holiday villa that is situated within an attractive landscaped garden. Graceful mahogany trees and indigenous plants and flowers make up the home's surroundings. Solandra is an idyllic holiday villa that is situated within an attractive landscaped garden. Graceful mahogany trees and indigenous plants and flowers make up the home's surroundings. 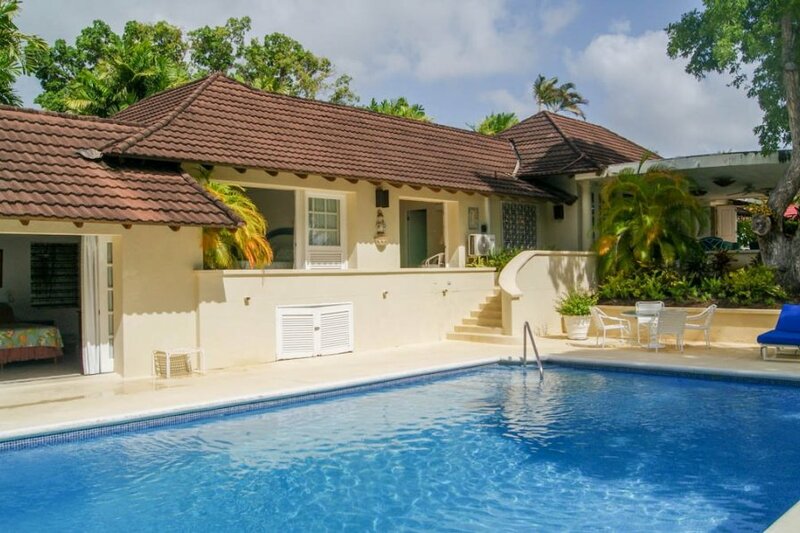 The villa is sat on top of a hill, a mile away from any noise, so provides a peaceful location to enjoy Barbados from. Solandra's open plan living and dining area boasts gorgeous high wooden ceilings and three large arched doors that lead out onto the gardens. The room is minimally decorated with vibrant bursts of colour and modern furniture. The garden includes a large patio which has plenty of seating and tables, making it perfect for daytime and evening socialising. The patio is elegantly styled with striking artworks decorated onto tables and colourful sun loungers and chairs. The kitchen at Solandra is spacious and contains windows that look out onto the garden. It boasts an island in the centre, which is ideal for preparing quick snacks and beverages for dinner parties. The villa's bedrooms open out onto the pool terrace. It'll be easy to go for a morning swim in the glistening waters while holidaying here and the pool also comes equipped with sun loungers. The bedrooms benefit from striking prints and patterns as well as natural light and ceiling fans for comfort in the hot climate. Solandra exudes luxury and there is no better example of this than in the villa's spa-like bathrooms that are tastefully enhanced with marble floors and neutral colours. The master suite contains a chandelier in its en-suite bathroom that hangs over a Jacuzzi style bath tub. Make sure to spend some time pampering yourself here. The garden has a plethora of space. Kids will love playing games and rolling around in the freshly cut lawn. There is also a huge beach cabana where guests can retreat to after long days spent out in the sunshine. Set within a beautifully landscaped garden and surrounded by stalwart mahogany trees, Solandra is a 3-bedroom villa with a swimming pool. St. Nicholas Abbey is a wonderful attraction located just a 25-minute drive away. This site is open from Sunday to Friday and comprises of a grand great house, gardens and gullies, a rum distillery and Cherry Tree Hill. Free guided tours are offered, taking you throughout the magnificent house and the gardens. You will also be able to watch a charming black and white home movie, revealing what life was like way back then – circa 1935. Take a tour around the museum while enjoying a complimentary Bajan rum punch and see how sugar cane is made and processed. Cherry Tree Hill is where you go to take in awe-inspiring views of the east coast of the island. Once you've tired yourself out, the Terrace Cafe awaits you ready to serve delectable lunches and light snacks. Mount Gay Rum Distilleries provides a great way to learn and taste the island's most famous liquor – rum! At a 15-minute drive away, the distilleries tell the story of the world-renowned Mount Gay Rum. The liquor is the oldest rum in the world, which is why it is widely referred to as ‘the rum that invented rum.' Guests visiting the distilleries will get to learn all about this exciting product. Some tours will provide visitors with the irresistible opportunity to mix and create cocktails or devour a traditional Bajan lunch.